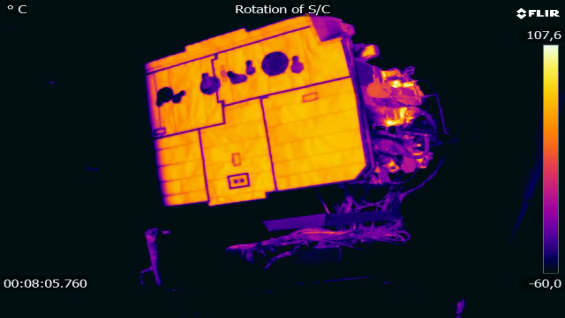 Having successfully completed its thermal-vacuum tests in December, Solar Orbiter has been subjected to a new series of arduous environmental tests at the IABG facility in Ottobrunn, Germany, including intense shaking of the spacecraft to ensure that it will survive the stress of launch. Solar Orbiter during thermal-vacuum tests. Click here for details and large versions of the video. Credit: Airbus Defence and Space/IABG. The year began with alignment checks of all the instruments, thrusters and other critical components on the Solar Orbiter Protoflight Model (PFM). This was done to demonstrate the thermal stability of these sensitive components when exposed to the extreme temperature variations and vacuum conditions of deep space. The checks were passed with flying colours. The spacecraft, in a stowed configuration as it will be within the shroud of the Atlas V launch vehicle, was then built up into a more complete representation of the flight model, prior to the start of the mechanical vibration test campaign. Two solar arrays were fitted onto the spacecraft. These have been specially designed to ensure they provide sufficient electrical power and survive the intense solar heat, whilst minimising the influence of stray light and build-up of electrical charge on the platform and instruments during Solar Orbiter's close approaches to the Sun. The instrument boom, fitted with its full suite of scientific instruments, was also integrated to the spacecraft's platform and further reference alignment measurements were carried out. Now in its full flight configuration, but with all appendages still stowed, the spacecraft went through a number of pre-vibration manual deployment tests. These will be used as a reference for comparison with the final 'live-fire' deployment tests that will be conducted after the vibration test campaign. These preliminary tests were completed for the instrument boom and both solar arrays, as well as the high-gain and medium-gain antennas. The manual deployment tests confirmed that no snags could occur during the initial deployment. Since the various appendages are not designed for deployment under Earth gravity, the procedure required a series of specially designed off-load rigs. These allow near frictionless deployment of the suspended parts, while simulating the weightlessness of space. To enable each off-load rig to protect the deployable hardware, the spacecraft had to be orientated during each test so that the plane of the deployment was parallel to the ground. Once the tests were completed, all of the deployed items were re-stowed and small hold-down-and-release devices were attached to them, ready to be fired after completion of the vibration test campaign. The mechanical vibration test phase is designed to confirm and verify the suitability of the spacecraft to survive the lift-off and journey to reach its operational orbits around the Sun. The testing was divided into two parts. The first of these, the sine vibration test campaign, replicated the powerful thrust of the Atlas V launcher, sudden engine cut-offs and lateral wind shear events throughout the launch and ascent, by mounting the spacecraft on an electro-mechanical shaker. The sine vibrations were applied separately up to a frequency of 100 Hz in three axes. A series of low-level signature runs was made before and after the main qualifying events, to determine whether the PFM's structural integrity had changed. These proved that the spacecraft was able to survive the heavy shaking to which it was exposed. This mechanical shaking was followed by acoustic tests, which covered the frequency spectrum from just below 100 Hz all the way up to 8 kHz. The largest excitations in the acoustic chamber existed in the approximate range of 100 to 500 Hz. A number of tests were undertaken as the acoustic noise pressure was steadily increased toward the final qualification levels required by the Solar Orbiter PFM. Once the major segments of vibration testing were completed, the electrical health of the spacecraft was checked, in order to confirm survivability of all electrical systems. After the successful completion of the mechanical vibration tests, the team has re-measured the alignments of all instruments and other critical items. The data demonstrated very good alignment stability, in particular for the remote-sensing optical instruments. Meanwhile, all the deployable appendages on the spacecraft are being deployed again, using the off-load rigs. This time, however, the various hold-down devices are all being fired to simulate post-launch deployment of both antennas, the solar arrays and the instrument boom. The boom has two phases of deployment, but only the first can be effectively deployed on the ground. These deployed structures will then be returned to their stowed configuration and the hold-down release mechanisms will be re-commissioned, ready for flight. A set of measurements of the spacecraft's mass properties will also be completed in the first week of April. For this, the spacecraft will be mounted on a mass property measurement rig that performs a series of tilt and rotation operations. This determines the inertia, mass and centre of gravity of the spacecraft, characteristics that are important to enable the attitude/orientation control system to control Solar Orbiter's orientation once in space. Later in the year, a new series of tests is planned to determine the magnetic signature of the spacecraft. These checks will be carried out in a facility that is largely made of non-magnetic materials like wood and aluminium and has a minimum metallic content, enabling the spacecraft's magnetic characteristics to be measured in isolation from external influences. Solar Orbiter's mission is to perform unprecedented close-up observations of the Sun. Its unique orbit will allow scientists to study the Sun and its corona in much more detail than previously possible, and to observe specific features for longer periods than can ever be reached by any spacecraft circling the Earth. In addition, Solar Orbiter will measure the solar wind close to the Sun, in an almost pristine state, and provide high-resolution images of the uncharted polar regions of the Sun. It will carry 10 state-of-the-art instruments. Remote-sensing payloads will perform high-resolution imaging of the Sun's atmosphere – the corona – as well as the solar disk. Other instruments will measure the solar wind and the solar magnetic fields in the vicinity of the orbiter. This will give us unprecedented insight into how our parent star works, and how we can better predict periods of stormy space weather, which are related to coronal mass ejections (CMEs) that the Sun throws our way from time to time. Scheduled for launch in February 2020, Solar Orbiter will take just under two years to reach its initial operational orbit, taking advantage of gravity-assist flybys of Earth and Venus, and will subsequently enter a highly elliptical orbit around the Sun. Solar Orbiter is an ESA-led mission with strong NASA participation.